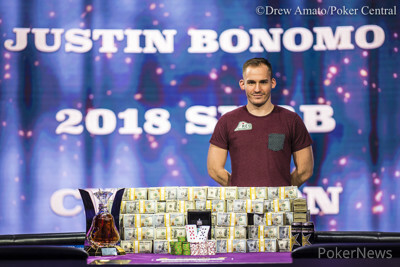 Twenty-six hours ago, Justin Bonomo stared at the purple felt in the PokerGO studio as the river card prepared to hit, one card from elimination on the bubble. Now, he has emerged victorious against an ultra-elite field in the $300,000 Super High Roller Bowl for a career-best $5 million. The win continues Bonomo's spectacular 2018, which has seen him lap the field with nearly $14 million in cashes, more than $5 million clear of nearest competitor Jason Koon. Bonomo already won Super High Roller Bowl China, which had a buy-in of about $250,000, for $4.8 million. Even Fedor Holz's legendary 2016, which saw him win more than $16 million, looks exceedingly likely to be surpassed now. Bonomo repeatedly said in the lead-up to this final table that he felt his whole career had built to this moment. He came up grinding as one of the brightest stars online more than a decade ago and transitioned into one of the preeminent live crushers with a WSOP bracelet, piles of high roller wins and more than $31 million in cashes. "I've watched the game change," he said. "I've used all the methods and learned all the games. I finally feel like I'm on top." No matter how much poker changes, though, a bit of good luck will always play a huge role in any outcome. Never has that been more true for Bonomo than late on Day 3, when he was all in with ace-ten suited against the kings of Christoph Vogelsang. A ten hit the flop but Bonomo needed more help and he found it when an ace arrived on the river to save him. Afterward, Bonomo admitted to Daniel Negreanu that he did not have a particularly fun day. The final day would prove a little easier for his heart. He wasn't worried much about early ladders coming in essentially tied with Negreanu and Mikita Badziakouski for the lead, but he secured more money right away when Nick Petrangelo busted first hand running tens into Koon's queens. Vogelsang came in the shortest and followed in fairly short order in fifth. The defending champ acquitted himself well with another strong showing a year after he pocketed $6 million. Start-of-day leader Badziakouski had a tough go of it despite being the one to bust the German. The key pot came up in Level 21 (20,000/40,000/30,000) when Badziakouski played a three-bet pot with Negreanu, holding ace-queen against sixes. The Belarusian bluffed off 2 million, half of his stack, postflop repping a middling board when Negreanu was the one holding a straight. Bonomo took the rest of it in a battle of blinds where both players flopped top pair and Bonomo's king kicker was superior to Badziakouski's eight. Badziakouski had to be disappointed with fourth place. With three players left, Bonomo had his only moment on the final day where he found himself at risk with cards to come. However, it proved a minimal sweat since he had flopped top two against Koon's middle two in a three-bet pot, with the money going in on the turn and Koon having only two outs. The river bricked and Koon was left with about 15 big blinds and couldn't recover. Bonomo had a huge lead of about 4-1 against Negreanu, but "Kid Poker" wouldn't be a pushover. He won some decent pots and closed the gap. However, he picked a bad time to commit to a raising war and get stacks in with second pair and an open-ender as Bonomo had top set of nines. Negreanu missed a draw on the final hand and had to settle for second. Afterward, he was asked if it was any consolation that he had left it all out there after playing some great poker over the past few days. "Yeah, and I got $3 million, too," he said with a laugh. "Took a shot. Five or a ten and we're in business. But, we got a deserving champ." 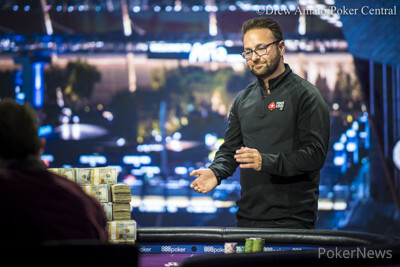 For his part, Bonomo highlighted the fact that Negreanu has stayed so competitive at the top level of the game when so many others have fallen by the wayside. "Kudos to him for staying at the top," Bonomo said. Indeed, few have stood the test of time like Negreanu. But based on his tremendous run over the past decade-plus, culminating in this $5 million moment, Bonomo looks like a player that could follow in Kid Poker's footsteps if he so chooses. Players are on a break. Action will resume shortly. Justin Bonomo again opened to 160,000 with and Daniel Negreanu just called with . The flop with two undercards looked well for Negreanu but, unfortunately for him, Bonomo paired his ten. Negreanu check-called 125,000 and checked the turn. Bonomo went for a small sizing, firing 210,000 but Negreanu made a good laydown, not willing to give up any more chips. 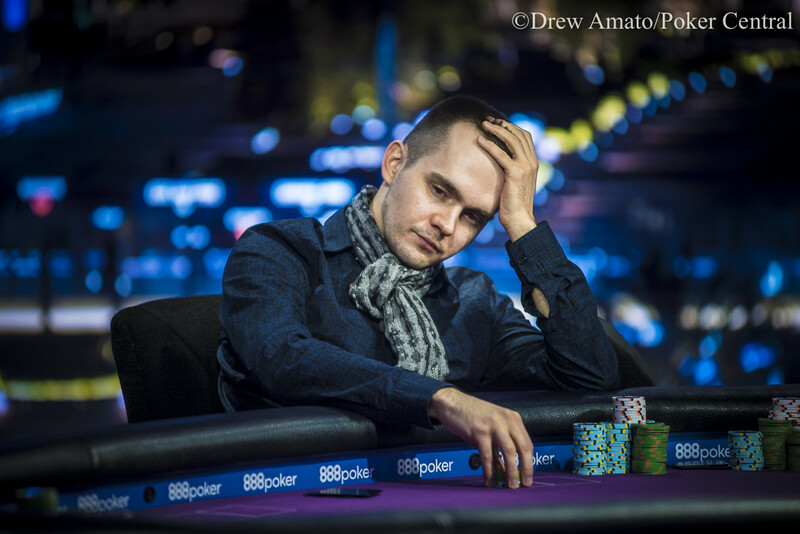 Justin Bonomo raised to 160,000 and Daniel Negreanu defended his big. The favored Bonomo who had . He checked back and Negreanu got in front on the turn as his hit two pair when the turn landed. Negreanu led out 150,000 and Bonomo called. The brought an inferior two pair for Bonomo and Negreanu opted for a tricky check. Bonomo then fired 500,000 but Negreanu snapped him off with the winning hand. Justin Bonomo made it 160,000 with and Daniel Negreanu called with . Both players hit a middle pair on the where Negreanu check-called another 125,000. Negreanu had it locked on the turn but Bonomo checked back this time. The was a brick and Negreanu led out 600,000. Bonomo evaluated his third pair as a good bluff-catcher and called, shipping some more chips to his rival. Daniel Negreanu raised to 150,000 with and Justin Bonomo called with . The flop was checked through and Bonomo overbet the turn, firing 450,000. Negreanu had paired his trey and called. Negreanu got there on the river, hitting two pair. Bonomo fired 900,000 for value but Negreanu called with the winner. Bonomo leant forward to look at his two pair and nodded. Daniel Negreanu three-bet to 560,000 with and Justin Bonomo, after opening with , called. Both checked the flop to a board of and Negreanu bet 300,000. Bonomo called. The river was the and Negreanu checked. Bonomo bet 900,000. "Quite a card," Negreanu said with a sigh. He folded at the close of his 30 seconds.